The flat build uses the same pistol handle theory as TDI's larger knives, but the grip only accommodates two fingers. The jimped spine of the blade allows some backup pressure from your thumb, but there's very little knife here to hang on to. The hard plastic sheath of the LDK could be worn on a necklace, with the knife hanging upside down in the friction lock scabbard. A firm tug on the handle pulls it loose, but the bouncing and vibration of a hard run should leave it in place. The small size makes the knife easily concealed. Ka-Bar suggests that the LDK tucks discreetly away under harness straps -- stitched on through the edges of the sheath -- if you're suited up for tactical assault. Tucked away in a civilian pocket or purse, or strapped to running gear, the LDK could be a confidence builder for some. 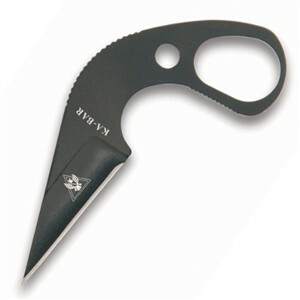 TDI's fighting concept regards the knife as a claw, and the unique handle orientation presents the blade in that instinctive way. Made from 9Cr18 high carbon steel, hollow ground at a shallow 15-degree angle, the tiny LDK holds a razor-sharp edge. The small size is also the knife's biggest problem -- the LDK isn't large enough to grip securely. You'll want something bigger as a primary defense, and something bigger as a backup. As a backup for the backup blade, the LDK is still borderline, but it might be all you have left. At 0.15 lbs, it won't drag you down.